Preheat the oven to 450°F. Bring a large pot of water to a vigorous boil, add ½ teaspoon of the salt, then add the carrots. Blanch for 1 minute and remove to a bowl of ice water to stop the cooking. Once cool, remove and set aside. Place the beets in a large pot of cold water. Bring to a boil, add the remaining ½ teaspoon of salt, and simmer until the beets are tender. Strain the beets and peel them using paper towels to rub off the skin. This is easier when they are still warm. Crumble the feta and set aside. Toss the carrots with ½ tablespoon of the olive oil and place them on half of a rimmed baking sheet. Toss the beets with the remaining olive oil and place on the other half of the baking sheet. Roast for 15 minutes. Remove the beets and carrots from the oven and place in separate bowls. 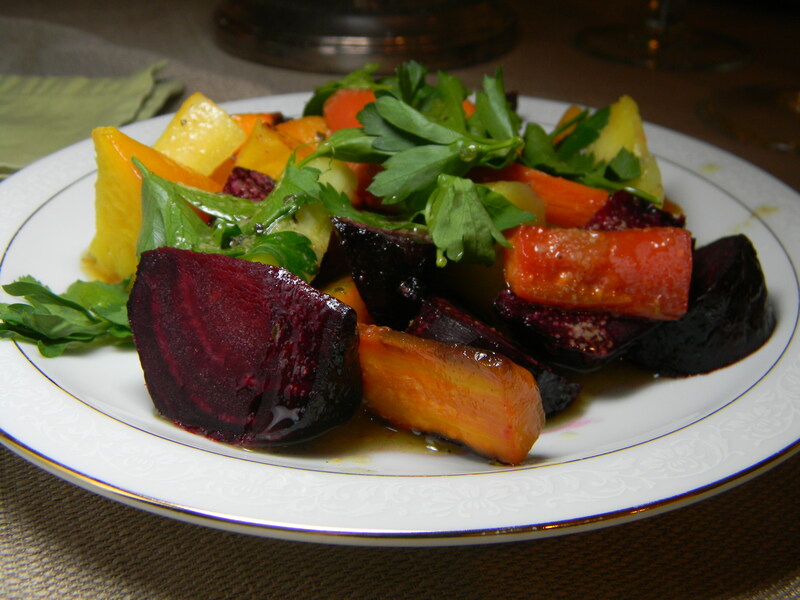 Add 1 tablespoon of the vinaigrette and ½ cup of the parsley to the beets and toss. Add 1 tablespoon of the vinaigrette, the remaining parsley, and the feta to the carrots and toss. Divide the carrots evenly among 6 plates. Then divide the beets evenly among the plates and gently mix with the carrots. Drizzle with a touch more of the vinaigrette. * You may notice from the picture that our salad didn’t include feta. It was still delicious without it, and more healthy, but… go for the feta if you have it! Place the Dijon mustard in a bowl and whisk in the olive oil, then the lemon juice and the sherry vinegar. Add the cumin and the mint. Season with salt and pepper to taste. The vinaigrette will last for 10 days in the fridge.